Makalali Private Game Lodge is a leader in the ultimate African safari experience, this Limpopo safari lodge in South Africa, will leave a lasting impression of excellence. 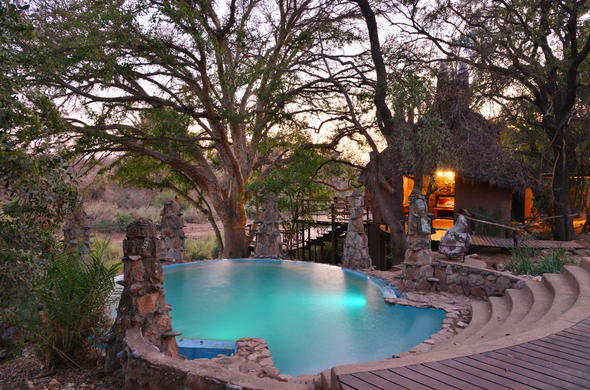 This Limpopo safari lodge has reintroduced Lion, Cheetah, Leopard, Elephant, and Rhino, making Makalali Private Game Reserve home to over one thousand wild animals including four of Africa's Big Five. The accommodation, activities, and facilities available at this Limpopo safari lodge truly meet the needs of guests and their children. At Makalali Private Game Lodge there are mini-ranger programmes for the children and a host of other interesting and exciting activities both on the reserve and in the surrounding area. Makalali believes in traditional tracking methods for enhanced game viewing, this effective hands-on approach is a tried and trusted way of experiencing the African wilderness. Makalali Private Game Lodge is a very special Limpopo safari lodge in that all guests are treated like kings - nothing is too much trouble and supreme service is a standard. The international award winning architecture and decor of this safari lodge in South Africa is innovative and quite unique making Makalali Private Game Lodge an unforgettable ethnic bush retreat. Makalali provides the perfect venue for weddings and functions; it also offers excellent self-contained conference facilities for up to 60 people with entertaining Team Building and fun activities catered for.